If you are about to graduate or have just done and need some amazing, out-of-this-world, outstandingly memorable trip ideas then you're in luck! Each of these 12 fun options are perfect for any group size, groups with a large range of interests, and seniors who are ready to celebrate and travel! From the ocean to the tops of mountains, from New York City to San Francisco, these graduation trips will blow you away! Beach: Of course our number one choice for the best graduation trip is hands down a trip to the beach. It's the perfect celebratory destination that mixes major city sightseeing, recreation, and ecology and scenery viewing into one seriously fun trip! Cruise: What can be better than lying on a beach celebrating graduation? How about cruising along the waters lying on the deck of a cruise-liner, seeing all the tropical sights and eating all the delicious international cuisine you can along the way? Mountain Climb: More and more seniors are hopping aboard the "get active" travel craze, which is a trend we are more than happy to continue! Head to the mountains and sign up for a guided climb or sightseeing tour. After all, you graduated high school, you can climb a mountain! Hike: Much like the previous option, this is an excellent way to get active, see some of mother nature’s most impressive scenes, and celebrate graduation in a completely recreational way! Head to any local state park or any national park, each providing excellent graduation trip options! Picnic and camp for an extended stay option too! Road Trip: We absolutely love the thought of road tripping for your big graduation celebration, the perfect option for both big and small groups, groups with a wide variety of interests, or groups who don’t exactly have a major plan but they just want to travel. Hit up several major cities, sight-see a local state, or just make it from one coast to the other, the options with this one are endless! City Circuit: If you have several different cities in mind to celebrate and can’t decide, just make a city circuit trip! Hit several clustered cities in New York or California, seeing the top attractions in each, or choose two or three major cities to fly to in a circuit. Sightseeing, culture immersion, and great food are all amazing reasons to city hop! Our Choice: Head to New York and see NYC, Brooklyn, and Buffalo! 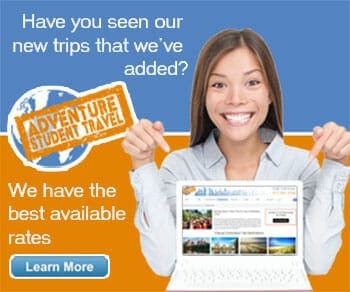 College Campus: This is one of the most intelligent options for graduation trips, a multi-tasking reward trip that allows you to travel to a new city to see the top attractions, eateries, and landmarks, as well as to the top local universities to get a jump start on college prep and moving! Sight-see: This may seem like a vague option, but we believe there can be nothing more satisfying for a big graduation trip than just planning a weekend of sightseeing in a major city. It can be local, undiscovered, unexplored, or just a dream destination, just plan a couple days of seeing all you can of one particular area. Our Choice: Chicago - skyscrapers, lake shore, and amazing architecture! Volunteer: If budget is an issue, or if you just want to give back a little for your grad trip, a volunteer journey is the right option for you. There are several different organizations throughout the U.S. that allow students to travel for free, or close to free, in order to help others. This is how to make your trip really count! Marathon: Sticking with the "get fit" trend, there are several students who are opting for a more strenuous grad trip, one that involves showing their skills, effort, and ability in any local or major distant marathon. You can get creative and grab your group for a fun color run or glow in the dark race, or head to a major event like the Boston or NYC Marathons! Theme Park: This choice is timeless. Almost every senior group will be completely happy with the opportunity to head to a major theme park like Six Flags, Walt Disney World, or Universal Studios. You can make a weekend out of a trip like this and hit up the local water parks as well, or just spend one big day away, either way this is an excellent celebration option! Food Tour: One thing that every traveler of every age can agree on? Food! With such a wide variety of touring options for students within the U.S., it is extremely easy to find a food based tour in major cities, ones that allow you to taste the culture, sight-see, and even learn a little bit. Your stomach and sense of adventure will thank you!